I rarely bake cakes but winters come with the excuse of keeping the kitchen warm. Also, who doesn't like nice and warm aromas of something being baked in the kitchen? This is the time I keep looking for opportunities to bake some cake to be shared with someone or to be taken somewhere as we don't eat much cake at home. 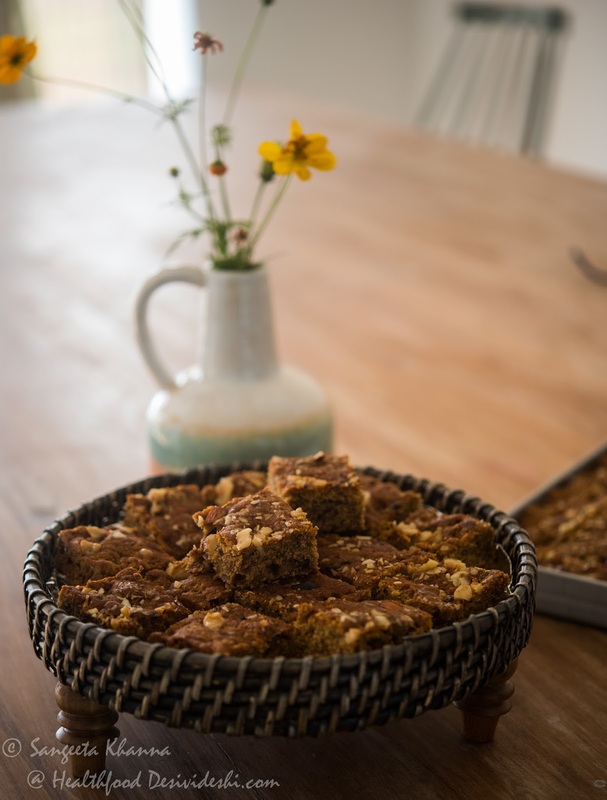 So this time when we visited our friends at Tijara farm I thought of baking a dates and walnut cake without added sugar as one of our hosts is diabetic and everyone else likes lightly sweetened desserts. The liberal use of nuts and whole wheat makes this cake low glycemic too. It happens quite often that I end up adding some flavours to the cake just for the sake of making my kitchen smell warm and cozy. 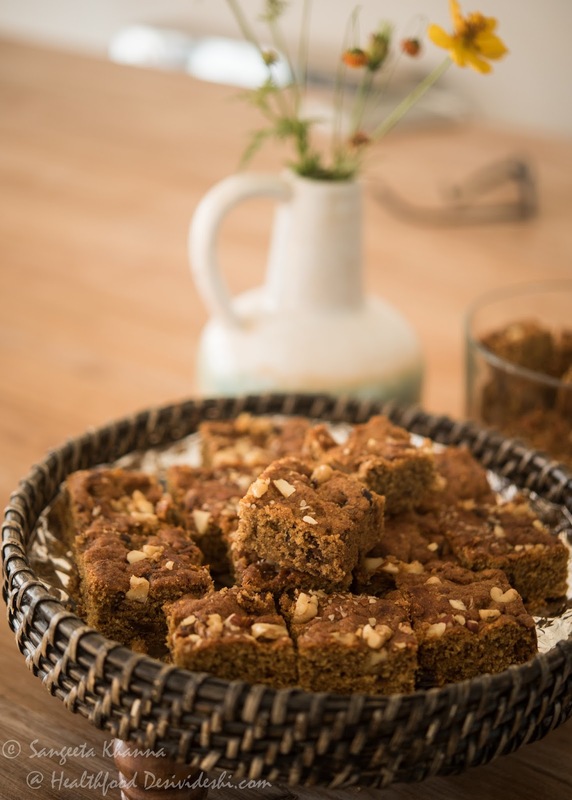 This lightly spiced dates and walnut cake made using whole wheat flour was a result of one such impulsive moment when I added garam masala along with rum to the cake batter, the result was so good I wanted to bring back a few slices for ourselves, to be enjoyed later. Usually I bake such cakes in a loaf tin but I realised I need to bake a larger cake so I decided to make it a tray bake. Baking it in a tray helps get a wider crust in each piece of cake, a very important feature in whole grain cakes with chopped nuts as the crumb can be really crumbly sometimes when sliced out of a loaf cake.So even if you decide to bake this cake in a loaf tin, keep the height of the cake less. Chop the dates so they distribute well in the batter. If the dates are hard ones you can soak and make a paste. It shouldn't get too loose as it affects the consistency of the cake batter. It should be a thick jam like consistency.You can use ready made date paste if you wish. 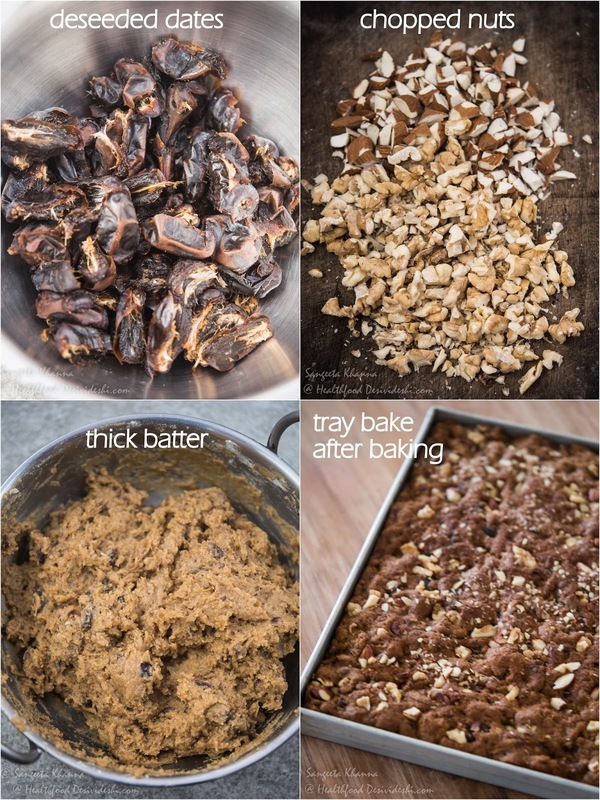 Mix the rum with date paste if using. Keep aside. In a separate mixing bowl, add the baking powder, baking soda, salt and garam masala to the flour and use a whisk to mix well. You can sieve the whole mix to ensure better mixing. Keep aside. Mix the eggs with melted butter (room temperature or 25-30 C) and whisk till it becomes creamy smooth. Add vanilla extract and the date paste and whisk again and let the date paste loosen to make the mix smooth. Now add 1/3 the flour mix and whisk to mix, fold in the remaining flour mix in two parts till the mix becomes a thick batter with a consistency of muffin batter. Fold in 2/3 of the chopped nuts and spread the batter in a baking tray (9"X12"). Pat down to smooth the surface, sprinkle remaining nuts and press a little. Bake in a preheated oven at 170C for 40 minutes. 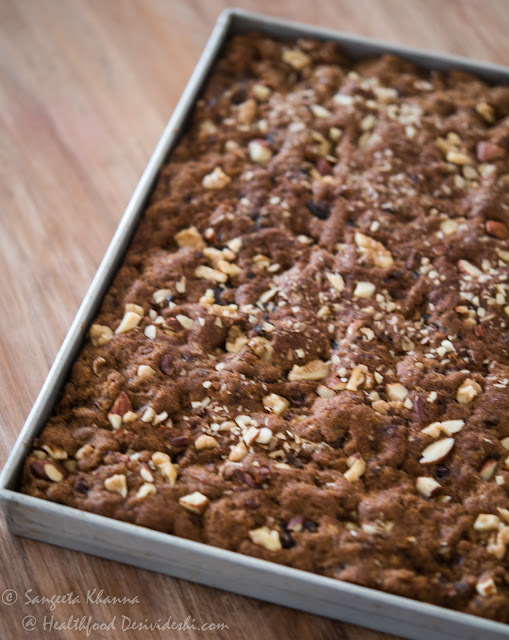 Let the tray bake cool down completely before cutting squares. 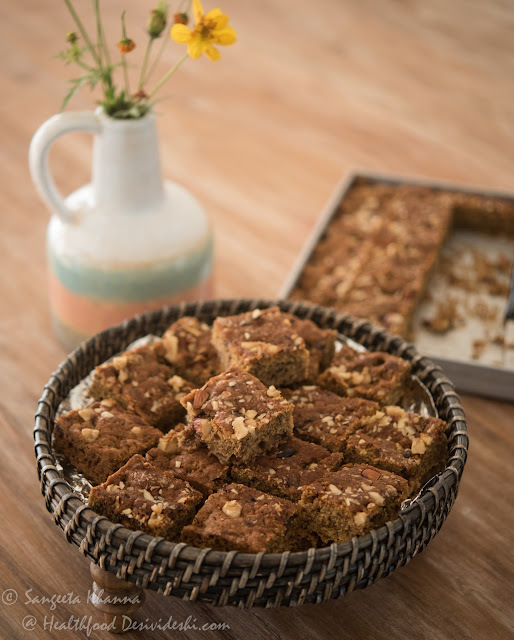 Use a sharp knife pressing down (not sliding across) to cut pieces as the crumb of this cake is quite delicate and the pieces of nuts cause some breakage if you are not careful. You can store the cake in an airtight cake box and refrigerate for 2 weeks or so. At room temperature it stays for 3 days. Serve at room temperature or warm as per choice. You might like it warm with a drizzle of honey or maple syrup if serving for dessert and plain with hot milk if it is a part of breakfast. But the cake tastes great even at room temperature in this season. I had baked this cake for a gathering where most people like lightly sweetened desserts and everyone had it without any sweet additives apart from a child who didn't take second helping. With any such lightly sweetened dessert, I would recommend taking at least 2 bites before deciding to top it with honey, or syrup, as once the palate starts recognizing the natural sweetness the added sweetener will not be required. PS : Since I mentioned that this cake recipe is suitable for diabetics too, I must clear the fact that the use of eggs and nuts makes this recipe low on Glycemic Index. Else dates are not suitable for all diabetics even in a cake like this. So if you are tweaking this recipe and substituting eggs with a replacement or if you use lesser amount of nuts, please do not consider it suitable for diabetics.